My GOP gone by, I miss it so. 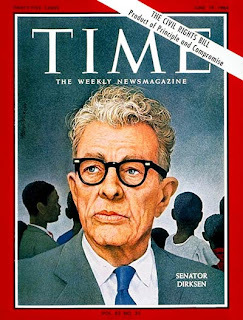 Conservatives are fond of the saying widely, but probably falsely, attributed to Everett Dirksen: “A billion here, a billion there, and pretty soon you’re talking real money.” Of course, the saying hasn’t kept up to date with inflation or with the growing size of the federal budget–in 1962, a billion dollars was just under 1 percent of the entire budget; these days, it would be well under 1/1000th of a percent of the federal government’s outlays. It’s not every day that Congress debates whether to spend $1 million — given that current federal spending is just over $4 trillion. But the House voted Friday 204-203 to approve an amendment by Rep Steve Scalise, R-Jefferson, which strikes $1 million from a 2013 congressional funding bill intended to cover closing costs for the Open World Leadership Center. …Scalise explained why he’s going after such a relatively small allocation. “It’s $1 million less than we’ll be borrowing from China and at some point they say $1 million here, $1 million there, pretty soon you are talking about real money,” Scalise said. It is literally impossible to argue with that kind of logic. After a while, it becomes hard to attribute recent GOP efforts to terminate the American Community Survey, NSF funding for political science, federal funding for the US Institute of Peace, and so on to ignorance. Instead, it becomes more likely that the representatives in question know exactly what they’re doing and are hardly willing to listen to any arguments to the contrary. One more datum in this series comes from the fact that in the same session where Scalise’s amendment went through, the House cut an equivalent amount from the Congressional Research Service, presumably on the grounds that expert research is the antithesis of leadership. Fortunately for America, the committee did find $200,000 to print new pocket Constitutions for members and staff.